If you have any questions or want to enquire about dates, use our form to contact Lyn Peek or see their website for more information. Perfect for families: an old estate manager’s cottage which is one of two properties set in two and a half acres of gated grounds surrounding the owners’ Charentais manor house. The good-sized heated pool, set in the orchard overlooking the vineyards, is just for guests, while each cottage has its own terrace and courtyard garden with barbecue. Down a narrow driveway lined with shrubs and flowers is Manor Cottage: find a buttery-yellow sitting room with cosy armchairs and sofas, bedrooms that are a mix of old English checks and French toile de Jouy, two pristine shower rooms and a family bathroom downstairs. There’s a generous welcome pack: a bottle of Bordeaux, jams from the orchard, cakes, fresh fruit, coffee. Cooks will be content in the kitchen with its modern layout and white crockery, and plenty of space in the living room means you can eat at a table here or outside in good weather. Your kind hosts are there if you need them and can deliver breakfast if you are feeling particularly lazy! They’ll also give advice on vineyards to visit, and take you out in a classic car if you wish. Deeply relaxing. Manor Cottage is spacious, comfortable and very well equipped. The kitchen has everything you would need, the bed linen and towels were excellent quality and the whole property was spotless. A great base from which to explore the area but there is also a lovely pool for lazy hot days. Would definitely recommend. We stayed in Manor Cottage for a week in August. I couldn't recommend it highly enough. The cottage is lovely, spacious and well equipped. It's in a beautiful area surrounded by vineyards. Lyn and Graham were great hosts. They were always available for a quick chat and ready to offer information and advice on places to visit, restaurants, shops etc. Graham took us out for a spin in one of his Morgans. I think he was just delighted to have someone to show them off too. They gave us a nice bottle of wine with the welcome pack but the highlight was the apricot jam. Delicious. Had a fabulous week at rose cottage , Lynn & Graham made us feel very welcome, cottage was clean & well equipped with all you need for your stay . Plenty of fresh towels . Lovely garden areas & pool was fabulous . Would definitely recommend. Extremely spacious and well-equipped property with secluded outdoor spaces for dining and shared use of the heated swimming pool. The large living room has three sofas and room to spare! The owners are very welcoming and helpful. Nearby Cognac and the Charente River in particular are very pleasant places to visit. Would certainly recommend. 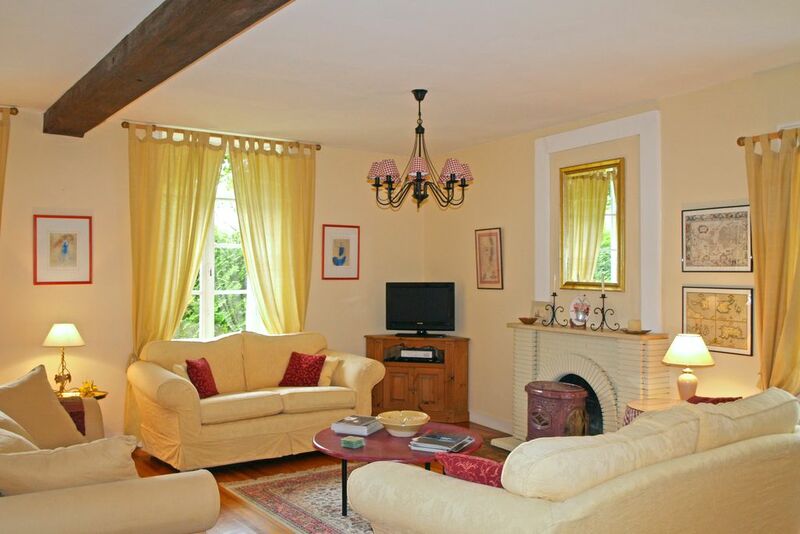 La Rose des Vents is a beautiful property to very high standard in a homely French country style. Graham and Lyn have clearly thought a lot about what is required to create a quality holiday experience from the decor to the range of equipment and not least the way that they look after the guests. Highly recommend. Super week - we had booked for earlier in the year (French fuel strikes prevented our visit) but Lynn was able to accommodate a postponement and it was well worth the wait - fabulous weather helped of course but Lynn had sorted out some fabulous venues and clear/interesting routes for us to take in our modern Aston Martin/Alfa Romeo cars; the routes and destinations were fantastic and it was equally wonderful to come home to a simple but sumptuous snack supper. Just the sort of holiday we like and our whole party of 6 enjoyed the organised trips and accommodation. We really couldn't ask more of a holiday let. Super welcome from Lyn and Graham, we had arranged for Lyn to cook for us one the first night and the meal was excellent. The accommodation, furniture, fittings, beds etc.. are beyond reproach. Pool is gorgeous and expertly maintained by Graham. The Peeks gave us lots of good advice of where to go for entertainment, shopping and good restaurants and we even got included in a classic car event they had organised. You can book this holiday with confidence. Could a holiday be more refreshing? The house was spacious and well appointed, both inside and out; the pool was a decent size and very clean. The Cognac region was interesting, with plenty of rustic charm, local markets, and easy routes to the coast. Our hosts were helpful and available, with great suggestions for activities and places to eat, but left us to do our own thing. The trip round the lanes in the Morgan was a genuine bonus! We had a wonderful stay at La Rose des Vents. The cottages were lovely (we rented both) and very well equipped and Graham and Lyn were so helpful recommending drives, places to visit and restaurants in this beautiful area of France. Perfect! We had a wonderful week at Manor Cottage in August. The cottage is beautiful and very well equipped . Lyn and Graham are perfect hosts and the welcome pack was super - especially the damson jam ! We ordered dinner on our first night which was delicious. We all enjoyed the tour in the Morgan. We wouldn't hesitate to return. When you find the perfect spot it's impossible to find anywhere else and that is what Manor Cottage is for us. In July 2014 we spent another 2 weeks in this delightful cottage for the third year in succession, so something must be right. The cottage is comfortably furnished with quality items. The accommodation and everything in it is first class. A choice of outside private seating area is wonderful, sun or shade, the choice is yours. Lyn and Graham are the perfect hosts where nothing is left to chance . See you next year Lyn and Graham. Four of us from New Zealand stayed at Manor Cottage for seven days. We loved the cottage and the fact that we had our own private courtyard where we could enjoy the wonderful wine and food that we had purchased during our day trips around the beautiful countryside. Lyn & Graham couldn't do enough for us and are wonderful hosts. We followed their devised scenic routes which were perfect, taking us to all sorts of places we didn't know existed. The gardens are beautiful and the pool perfect after a hot day sightseeing. A perfect stay. Very welcoming and nothing is too much trouble, with lovely cottage and swimming pool to enjoy with excellent meals in the garden.We stayed for 7 nights with our Morgan group of 7 cars/couples with lovely trips out and about villages and châteaus including excellent Angouleme racing and tour organised by Lyne & Graham with the chaos of French organisation adding to the ambience,which they took in their stride!Would definitely recommend a stay here for very,very comfortable accommodation and first class hospitality located in a lovely area close to Cognac. lovely place to stay, beautifully furnished and very well equipped, especially for fellow classic car enthusiasts when luggage space can be very limited. We had a fantastic holiday and would recommend the property to anyone else wanting a relaxing stay in the area. The hosts, Lyn and Graham are always ready to assist and give advice on where to go and what to do in the area. Thoroughly recommend it. Why not reserve a 3 or 4 course dinner with wine on the first night of your stay, to be served in your cottage or under the stars in your private garden? Put the children to bed, light the candles and just sit back and relax. Enjoy that "wind in your hair" experience with a complimentary ride through the vineyards in an iconic Morgan sports car, or if you wish you can hire a 4 seater Morgan during your stay. Bespoke classic car tours organised for small groups a speciality. Don't miss the Circuit des Remparts classic race meeting held at Angouleme each September.